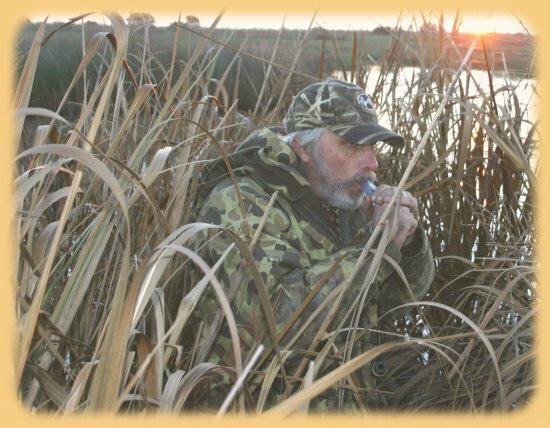 Our duck calls are the result of almost 50 years fascination with waterfowling and everything associated with it. It all began with my grandfather introducing me to duck hunting in the flooded timber bottoms of Arkansas and witnessing for the first time the beauty of ducks whiffling through the trees and the companionship of fellow hunters. Since that time my father and I, and later my son, have enjoyed yearly hunting trips back to Arkansas. Locally, my pursuit of waterfowl takes place in the tidewaters of coastal Georgia and the river swamps of the Altamaha River. In addtion to purchasing securely online through Paypal, our calls can be purchased at Altamaha River Trading Company located on the Altamaha River at Two Way Fish Camp off Hwy 17 in Glynn County Georgiaas well Kennedy Outfitters. I've always enjoyed making sawdust and in addition to call making have carved decoys and built a number of small boats.